The Purpose of this document is to provide guidelines for all structured cable installations installed by LEXX COMMUNICATIONS, INC. These guidelines should be followed unless otherwise noted and approved by the project foreman from LEXX COMMUNICATIONS, INC.
Areas not covered within this standard should be addressed with the project foreman from LEXX COMMUNICATIONS, INC. prior to the installation. At the main distribution closet (MDF) there will be data termination hardware and voice termination hardware. When applicable, the following guidelines presented below will be followed. The project foreman must approve all other situations. Mount a 3/4″ x 8′ x 8′ piece of plywood, painted with a fire rated paint, per the job foreman, or drawings provided by LEXX COMMUNICATIONS, INC.
Mount 7’x19” Chatsworth provided by LEXX COMMUNICATIONS, INC.
Place cabinet enclosure(s) (when used in place of relay rack). Place at least one horizontal wire managers for each patch panel. Mount the fiber distribution panel with bulkheads per the job specifications, when applicable. Mount 110 voice blocks on the backplane per job specifications. Cable service loops for voice and data cabling must be a minimum of 10’. Wire management on the side of the relay rack for patch cable management. Wire management down the side of the voice backplane and across the bottom for riser and station cable management. Wire management on the voice backplane at the top for cross connects management. Install ground wire #6 stranded from rack / patch panel location to main Building ground. Install Grounding buss at rack patch panel location. Ground all racks and patch panels to grounding buss. Install same grounding technique at any IDF locations. Cable runs will include voice and data cables for station runs, riser cables and backbone cables. The media used for these runs will be UTP/STP and/or fiber. Install all cables a minimum of 5” from all sources of electrical noise Interference of 2kv or less, a minimum of 12” from all sources of electrical noise Interference of 2kv to 5kv and a minimum of 24: from all sources of electrical Noise interference of 5kv or larger. Install cable management hardware per category 5E standards to manage all Cable bundles and individual cable runs. All UTP/STP station cable runs will be run with bends in the cable of 4x the size of the diameter of the cable or greater. Pulling tension for all UTP/STP shall be less than 25 lb. All conduit runs will be installed per the National Electric Code (NEC) and local codes. All vertical cable runs not placed inside walls shall be enclosed within a vertical raceway. All vertical cable runs placed in a plant or production area shall be placed inside EMT conduit with a steel back box. All cabled and cable bundles passing through walls that are smoke partitions and or fire rated walls shall be sleeved and fire stopped. All station cable runs going to work stations in moveable partitions shall be protected the entire distance. This shall be accomplished by means of the cable types shall be: Voice, category 3 or better, 4 pair, 100 ohm, neutral color. Data, category 5E, 4 pair, NORDX or equivalent, blue jacket. There shall be a service loop installed at all distribution closets. This service Loop shall be a 10-foot loop for UTP/STP and a 20-foot loop for fiber. All terminations shall be punched down with the proper impact tool. All terminations shall be 568B unless otherwise specified. All twists in cable pairs shall be maintained to no more than ½” from Termination point. There shall not be any split pairs. There shall not be a splice point in any cable runs. All cable ends shall be labeled at the time of termination within the last 6 inches of the cable at both ends. All cables shall be tested and the results of the test shall be provided to the customer. All data cables shall be tested for a minimum of line mapping, NEXT, attenuation, and length. Testing shall be done with a minimum of a 100 MHz analyzer and shall be scanned per the category 5E standards. All multimode fiber cabled should be scanned for power losses at 850nm and 1300nm. All cables will be labeled with their ID numbers as assigned by the job foreman. All station cable ends will be labeled within the last 6 inches of the cable. All faceplate labels shall be done with a p-touch or equivalent labeler. There will be no pen writing on faceplates. All fiber cables will be labeled in areas of potential danger so that it is identifiable as fiber. This installation used a Lucent technologies gigamax solution for all voice and data cabling. Our experience shows that many of the cabling installations taking place are not up to the standards set forth in publications such as TIA/EIA 568A. Too little attention is given to installations that the client does not see- above the ceiling. Let us give you the confidence of knowing that your network is running on cable installed the RIGHT WAY, even where you can’t see it! 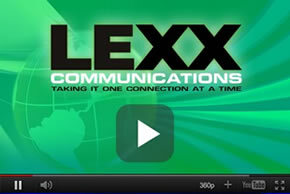 LEXX COMMUNICATIONS, INC. takes the proper grounding of your entire rack and enclosure system very seriously. Grounding is one of the most important, and unfortunately also one of the most frequently overlooked aspects of computer room set-up. Lack of a complete grounding system that goes back to a certified building ground can be extremely hazardous to both equipment and personnel. A proper ground starts with an attachment to the buildings service ground.